Do you live in Los Angeles or know someone who does? If so, you’re invited to join me for a FREE Plant-Based For Beginners Workshop Series at Whole Foods Arroyo Parkway on August 8th, 15th & 22nd! Even if you’re not a beginner when it comes to eating plant-based I am confident that you’ll learn something new and…. each workshop includes food! Free food is always a great reason to attend an event right? All the details and links to RSVP are below! I hope to see you there!!! Workshop + Cooking Demo & Tasting! Learn key tips for plant-based beginners! Megan will also share how to make 3 quick and easy plant-base dishes which you’ll get to taste test and take recipe cards home! Details: Registered Dietitian and HealthyGroceryGirl.com founder, Megan Roosevelt will take you on a tour of Whole Foods Market sharing her top 10 staples for living a delicious and realistic plant-based lifestyle. Megan will also share the health benefits and how to incorporate each grocery item into quick and easy recipes. The tour will end with a taste test of recommend grocery items and a time for for questions! 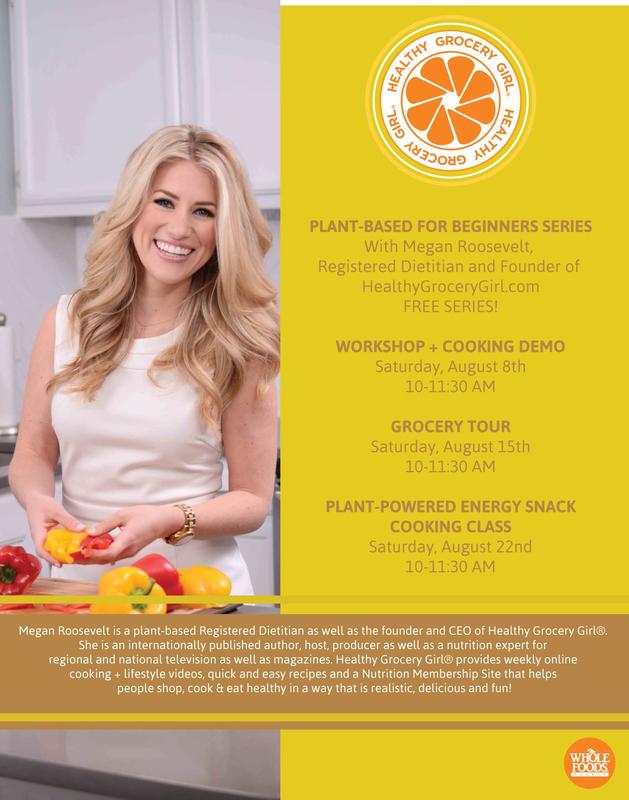 Details: Registered Dietitian and HealthyGroceryGirl.com founder, Megan Roosevelt will lead you in an interactive hands-on cooking class! You’ll learn how to make plant-powered energy snacks & the best part… you get to taste test and bring your creations home! I can’t wait to see you!! Bring a friend and don’t forget to RSVP!